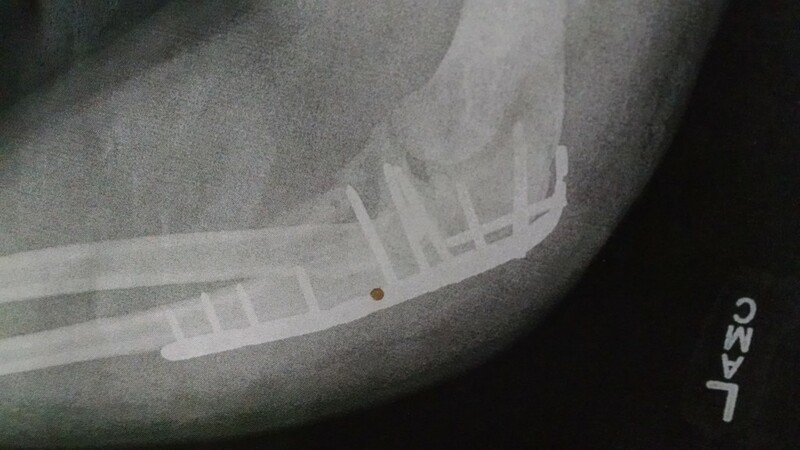 A bendable, stainless steel plate, and ten pins, in case you’re curious. Otherwise, not much going on this week until yesterday, one of my writing friends came over for some lessons in formatting ebooks. Or rather, her husband got the formatting walkthrough, while Stacy and I got some writing talk in. Then we went to dinner afterwards, with my husband. Always fun, and I always like helping other writers. What I read this week: I finished Indentured Hearts on Sunday, and wow, what a finish! A truly villainous antagonist, a life-or-death situation, and an ending that lived up to the can’t-put-it down beginning and rest of the book. 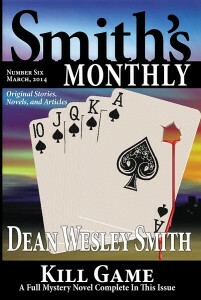 Then I started Smith’s Monthly #6, and read the short stories and serial segments. This is Dean Wesley Smith’s monthly magazine that contains around 80,000 words of fiction every month, including a new novel that he typically writes in about three weeks. One of the stories was written in another writer’s established world (with permission) that I wasn’t familiar with, so I didn’t get into that story. And another one seemed more like a sociological essay on something that might be possible, and while interesting, didn’t come across as much of a story to me. But there was also a new Poker Boy story, plus a Seeder’s Universe story, and those are always fun and entertaining. And in any case, it’s always interesting to read Dean’s work after reading his Writing in Public blogs where he discussed the writing of them. ROW80/Writing Update: ROW80 Round 3 officially ended this past Thursday. Did I meet my quarterly goals? Nope, not even close. I wanted to have the current WIP finished, but it wasn’t having that, ending up being much longer and more complex than I’d planned (and grew like this several times from the short story it was supposed to be at the beginning). Also, life stuff. Still, I’m not disappointed–the book is shaping up nicely, and is still moving forward, despite the life stuff. This past week was another one where I felt like I got almost nothing done at all, but upon checking, I got 1500 words in, so yay! There are some more life things (fortunately, good ones) planned this week, so I don’t know how much I’ll get done. If I get another 1500 words in, I’ll be happy with that. Although more would be better. ROW80 starts up again next Monday (Oct. 6), so if you’re a writer and would like a nice accountability challenge that fits in with whatever goals you set (and you can change them), consider joining us! Finally, What Inspires You? Karen McFarland asked this question on her blog a couple weeks ago, and tagged me as one of the folks to answer. Thanks, Karen! To answer that question, a lot of things inspire me. History, for sure, especially some of the amazing people from right here in my own backyard, like Orville and Wilbur Wright, Charles Kettering, and John H. Patterson. Beautiful places, especially the surprising ones that aren’t that far away, like Cumberland Gap National Park. And of course, the wonderful fiction I read. Like Karen, I find a lot of inspiration in music. And for me, the most inspiring, best writing music comes from Canadian electronic industrial band Front Line Assembly. Another of my favorites, and probably more “typical” FLA (if there is such a thing) is “The Storm,” from their Artificial Soldier album. I love the retro movie and TV footage in this one! 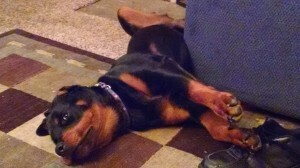 And how she can sleep in this position, I don’t know, but how can anyone resist? So tell me, what inspires you? I’m not going to tag anyone, but would love to see from my other blog friends who haven’t already been tagged. If you participated in ROW80 this round, how did you do? Even if you didn’t do ROW80, or aren’t even a writer, how did you do on whatever goals you might have? How was your week? Please share–I’d love to hear from you! 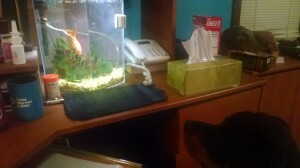 This entry was posted in Blog, ROW80 and tagged author, Front Line Assembly, goals, Inspiration, Jennette Marie Powell, Karen McFarland, puppy pictures, ROW80. I had fun on Saturday, even if I didn’t know what was going on! Haha! Hope I didn’t contribute to you not reaching your goal, although taking up a good chunk of your Saturday was bound to do that, wasn’t it? I really appreciate you taking the time to show my husband how to format. He gets it now, which is good, because I doubt I ever would! As for what inspires me, I guess I’d have to say my characters. They get in my head and talk to me. Without them, I wouldn’t be writing! Yikes – your hubby’s arm looks like a science experiment. I hope it all heals nicely and hes back and at it soon. Isis is just too adorable no matter what position she’s in. As for inspiration? It’s everywhere and hits at the most unexpected times. Usually nature inspires me or sometimes watching tv inspires me. I find I’m more inspired when I’m feeling grateful so I try to find things to be grateful for everyday. Inspiration just hits sometimes when you’re not even looking for it. I hope you have an inspiring fall. Stacy, I probably would’ve spent the afternoon goofing off if you hadn’t come over! I had fun, too! Patricia, thanks! You are so right – there’s inspiration to be found in all sorts of unexpected places. The first thing I thought of when I saw your husband’s xray? The Tingler-an old scary movie I saw as kid. I think it was parasites or something, but in the movie they showed it on xray.